UPDATE: Congratulations to Bri W. and Donna L. – they have won the Healthy Families BC contest. Both winners have been notified by e-mail. Thanks to all who played along! British Columbia has come a long way in the last decade in terms of healthy living and healthy eating. With a backyard as beautiful as BC’s, it’s impossible not to get outside and enjoy everything this Province has to offer. As Vancouver Islanders we, in particular, have a virtual paradise right outside our doors. We hike in Port Hardy, kayak in Qualicum Bay, ride bikes in Cobble Hill and surf in Ucluelet. With farms and food producers dotted up and down the Island, eating healthy with local food has never been easier. The Province of British Columbia has recently kicked off a health-focused initiative called Healthy Families BC. Its aim is to engage BC’s residents, educate them on the importance of healthy living and give them the tools and resources they need to live a healthy lifestyle. Healthy Families BC wants to reach out to all of BC and initiate exciting thoughts and discussion on healthy living. Their Facebook page is a great place to start! On the Healthy Families BC official website you’ll find comprehensive resources to start your own healthy living action plan. You can also follow Healthy Families BC on Twitter to stay in-the-loop about their new ideas. To enter to win, you must leave a comment below and tell me: your favourite Vancouver Island activity to stay in shape or your favourite locally-produced food and why it’s so good for you. I will draw one winner at random on Wednesday, August 31st at noon. Good luck! Keira-Anne.com contest winners from within the last six months are not eligible to win. The winner must reside within British Columbia. My favorite locally-produced food has to be Hazelmere Organic Farm. The produce there is delicious and very reasonable priced. It is good for our family because all produce is grown without pesticides and herbicides. My favorite locally produced food is the bags of organic salad greens from Nanoose Edibles. It is good for me because it is organically produced and has so much flavor I love to eat it. It is beautiful to look at on my dinner plate because it is full of edible flowers. So amazing! I am a Vancouver Island Girl at heart, no matter WHERE I live, that Island has the ability to provide both healthy eating and healthy lifestyles. Bees are pollinators and without pollinators about a third of our food supply would be unavailable. For activity I am a BIG fan of Mt. Washington, that place has so many options to keep fit between winter skiing or summer mountain biking, the options are limitless! Plus the Comox Valley is so awesome that you can ski in the morning and hit a round of golf or jump in a kayak in the afternoon all in the same day! One of my most favorite memories activity wise has been a snow shoe excursion one winter. Nothing is better then heading of the track of ski’s and wandering around with some trail mix, the birds and of course the epic views and great company. Plus it is a killer work out.. I love Vancouver Island and the options it provides! I love all activities in Strathcona Park for staying in shape!! Cross country AND downhill skiing, plus hiking, kayaking and canoeing! Not to mention world class lakes, mountains and HUGE waterfalls! Vancouver Island is the place to be active! My favourite Vancouver Island activity is going to yoga class. I also love hiking pretty much anywhere. I love cycling along the trails in Greater Victoria and enjoying the sun and ocean views. I love walking along the beaches overlooking mountains. Where else can you exercise in such a beautiful environment, where exercise is more like sight-seeing than hard work! Even if I can’t enter I’d say my favourite Vancouver Island activity is to explore the various guilf islands by doing the various nature walks and hikes. Of course, a paddle around the shoreline in a kayak isn’t too bad either! Doubt I can enter, but I’ll share anyway! @Tyler – Why do you doubt you can enter? The small print says that this contest is open to all residents of British Columbia. Hiking Top Bridge Trail in Parksville, followed by a delicious snack grab at Coombs Market! 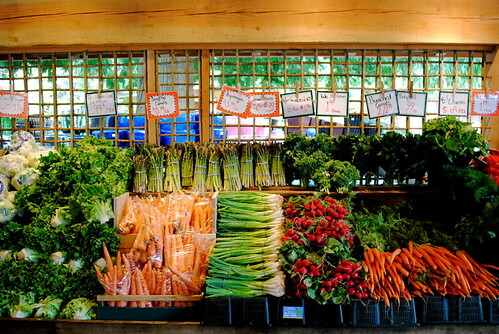 They have the most AMAZING homemade granola bars and fresh produce that will make your mouth water! Healthy Living Ideas: get outside whenever possible and be active. There’s no magic, its about smart food choices, exercise that suits your lifestyle be it running, yoga, cycling, kayaking or walking and treats in moderation including liquor. I have a garden and supplement with farmers produce and organic meats when possible. We all know this stuff, it’s about making better choices that = healthy living ideas. Vancouver Island, how it has opened my eyes to the sheer beauty Canada has to offer. Born and raised in the Ontario snow belt and travelling Coast to Coast, I have never appreciated anything more than being surrounded by the natural beauty of the mountains and ocean! Ever since I moved here some four years ago with my four legged best friend, Riya, we have yet to find anything that didn’t challenge or amaze us! We have hiked the Comox Glacier, Mt. Finny in Victoria (apparently I say Finlayson wrong, so it’s just easier to say Finny than to continuously be corrected) and have surfed the Tofino shores! My rule of thumb is, if Riya can’t participate then I can’t participate. There is nothing we enjoy more than to be challenged on rocky terrain, eventhough sometimes trying, once we have made the summit we sit, breathe in the crisp fresh air which reminds us of our efforts and enjoy the one thing money can’t buy, serenity. My favourite Vancouver Island healthy activity is canoeing! There are so many great places to go, my favourite is Mudge Island. I love walking around Rocky Point Park in Port Moody! I LOVE the hike to Cape Scott which begins just past Port Hardy and goes to the very northern tip of the island. The hike takes about 3 days to hike in and out at a moderate pace. It is beauiful with sandy beaches and old growth forest. I can’t wait to go with my boys in about 10 years. If you’ve never done this hike before I definitely recommend grabbing your backpack and hiking boots and hitting the trail!! There’s nothing better than local berries! Sweet, perfectly ripened, loaded with vitamins and anti-oxidants, and grown in our high quality soil. My favourite Vancouver Island activity is outdoor rock climbing. my favourite Vancouver Island activity is going for walks and hiking! Some fave trails include Thetis Lake, Elk Lake, and the Cedar Hill golf course. 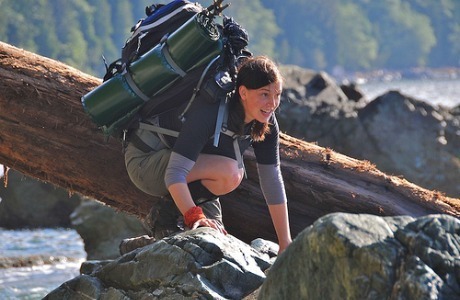 There are so many amazing outdoor activities to take part in on Vancouver Island! Some of my favourites are surfing in Tofino, hiking through out Strathcona park (especially love della falls), and kayaking where ever I can. We’re so fortunate to live in a place where the options for outdoor activities are almost limitless year-round! Walking along the beautiful beaches in Tofino! I enjoy running in our Comox Valley trails. I think it’s good for the soul. I love hiking with the dogs in Little Qualicum River Falls Park, which just so happens to be right in my own backyard! Snowboarding at Mt. Washington has got to be one of the greatest things ever. The terrain is so amazing! I also adore Tofino beach walks (crawling around on the rocks and checking out tide pools especially) and wandering Cathedral Grove. So beautiful! my fave local produce is organic raspberries, blueberries, and cherries. not only do they taste better and fresher, they’re also healthier. cherries contain lots of vit a and help me sleep better, blueberries have lots of antioxidant (although acai has more i’ve never tasted them), and raspberries have little calories so they can be my guilt-free snack anytime. I’m not from Vancouver Island, but whenever I do visit there I love to hike the many trails that I have come across. I remember hiking a trail near Cowichan Bay and thinking it was just beautiful! I hope to kayak near Tofino sometime in the spring. When I visit Vancouver Island, my favorite thing to do is to walk along the beaches in Tofino and walk in Cathedral Grove. I absolutely dream of hiking the West Coast Trail some day. All activities good for the soul. My favourite Vancouver Island activity to stay in shape is skiing on Mt. Washington. Favourite activity has to be anything in the water, swimming, surfing, kayaking! Outrigger canoeing in and around Victoria’s inner harbour!! I have no idea if this counts, but I think its rather local!! I buy fully certified organic cow! None of that whole ridiculous corn feeding pens for cows down south of us! Not only is the cow better tasting, by having a healthy and happy cow, we consume healthy meat! Yoga is my favourite way to keep in shape! An epic trail run on the Coast Trail in East Sooke Park. Two hours of roots, rocks, and trees with a stunning view of the Salish Sea leaves me with jello legs. My favorite activity is simply running the trails on Vancouver Island. Specifically in Nanaimo we have tons of off road options where one can spend hours hiking/running through nature. As for local food…. I love Piper’s meat market or even the Cedar Farmers Market in the summer! I love walking through the boardwalk trails in Pacific Rim National Park, just outside Tofino, or hiking pretty much anywhere. I also had a great time hiking/canoeing the Sayward Lakes trail near Campbell River a few years back. I love surfing in Tofino! What a workout! Followed up by some healthy local food and an evening spent with friends watching the ocean – for me, balance is key to healthy living. BC blueberries all the way! Not only are they fun to pick, but fun to eat as well as your teeth and gums turns a happy blue/purple from all the juicy rounds. Blueberry is low in calories. 100 g fresh berries provide only 57 calories. They are also packed full of nutrients like soluble dietary fiber, minerals, vitamins and pigment anti-oxidants. It’s my favourite superfood for sure. Running is definitely my favourite Vancouver Island healthy activity! It’s not unique to Vancouver Island by the scenery we’re blessed with here makes for beautiful, inspiring runs. I live on the Peninsula in Greater Victoria so my runs are decorated with local farms. In the summer I love to run past all the farms and take note of what they have in their stands so I can go back later and grocery shop! Local berries are definitely my favourites! Anything to do with our awesome beaches! Exploring the beaches with my dog, surfing on the west coast, coastal hiking trails….that’s healthy living to me. My favorite healthy thing to do is take my dogs for walks in the many beautiful parks this island has to offer. My favorite park is westsold lake. My favorite healthy thing to do is take my dogs for walks in the many beautiful parks this island has to offer. My favorite park is westwood lake. I love trekking about East Sooke Park with friends, followed by an ice cream cone at the gas station located in Sooke (it serves Island Farms ice creme). Yes, ice creme isn’t terribly good for you, BUT it is a treat that happens once in a while and after an afternoon of fun with friends, it’s the cherry on top of a day of fun And fun is good for the heart. My favorite activity is a nice brisk walk down the break-water. Beautiful scenery, and you can even catch a cruise ship! Honestly, I fantasize about early morning yoga practice on a Tofino beach. Realistically, anything I can do with 2 elementary school aged boys is my default-cycling (preferably off road), hiking (more like walking, but we call it hiking so the kids will think of themselves as ‘hikers’ and get better with distance and elevation), and swimming (pools and lakes for me, but I enjoy being lazy on the beach, watching the boys swim in the ocean….so at least they’re being active). I love eating fresh local produce, but a special treat now and then keeps my mind easy. Island Highlander Co. makes supreme almond tarts with shortbread crust and sticky toffee pudding, among other stuff. Having worked at the bakery on Oak Bay Ave (Victoria) I’ve become really picky about fresh, quality baked goods and I call these delish! My favourite activity to stay healthy & in shape is simply walking. There are many amazing trails near my home, a river down the street and a nature santuary/lake only a short walk away. I can enjoy beautiful scenery and watch wildlife along my many strolls and get in some exercise at the same time. I’m not on Vancouver Island right now, but when I was my favourite healthy activity was walking on the beach (I’m in the interior, so having an ocean beach to walk on was a novelty). I love blackberries. They grow for free all over the place and they contain polyphenols which help prevent cancer and heart disease. After many years of little to no physical activity I signed up to do a half marathon and I have never felt better. Getting exercise and fresh air – while raising money for a worthy cause, the Leukemia & Lymphoma Society. I lOve to swim… & sense it’s an island it’s probably one of the easiest and cheapest activities to do around town! Especially when the summer is nice! It’s good for you because your hydrating your body, staying active and probably enjoying some fun in the sun with friends and family! We eat lots of veggies in the summer, with all the good farmers around, and go too the lakes and rivers and ocean to swim and take in the vitamin D. The fruits are delicious this time of year too, love the Okanogan fruits. We went to play mini golf at parksville, that was great, and i clean the movie theater on the weekends, that helps with my weight. Growing up in, um, a different prairie province, I didn’t know how much fun could be had outdoors until I moved to BC and my now-husband took me on my first hike in Courtenay. Now, I love hiking and kayaking in our beautiful province, and run and do yoga to stay in shape. Our kids are still young so we mostly go on nature walks with them, but are excited to take them hiking and camping when they’re bigger! The Healthy Families BC initiative shouldn’t be too difficult, since I truly believe that this is the best province to raise a healthy family! What a lovely post and great giveaway!! Swimming at Fuller Lake in Chemainus is always one of my all time favorite activities! I only wish I had more time to get out there. I worked my stomach muscles good on Sunday pushing my sun bathing friends out into the middle of the lake on their rafts! The water was warm and lovely… it didn’t seem like I was getting a good workout until the next day 😉 Love it! I love riding on the Galloping Goose Trail into Victoria. Growing up on the island and then moving to the city proved to be quite the difference, as I noticed that there was just another pace that existed over on the mainland. As the years passed I noticed that I missed more and more, what I now lovingly refer to as ‘island time’. I try to create that same pace over here in my own life, as much as I can. Taking time to ensure that you are mentally refreshed keeps your body ready to take on daily challenges. 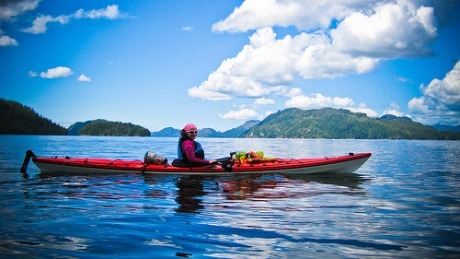 My favourite activity is to do Yoga or Sea Kayaking in Tofino/Ucluelet area.